This brief report summarizes the literature on electronic media and sleep and provides research recommendations. This topic is important and timely because of the pervasive and understudied use of screen-based media and the high prevalence of insufficient sleep among American youth and teens. Recent systematic reviews demonstrate that an overwhelming number of studies indicate an adverse relationship between healthful sleep and screen use, because screen time results in later bedtimes and reduced total sleep time. This is likely because time spent on screens takes the place of time spent sleeping, screen use can be psychologically stimulating, and the light from screens can disrupt functions like the circadian clock, sleep physiology, and alertness. However, the current understanding of these processes is limited by cross-sectional, observational, and self-reported data. Further observational, experimental and intervention research is needed to understand how digital media change sleep and circadian rhythms from infancy to adulthood, including how this change may result in poor health, learning, and negative physical outcomes (such as depression, obesity, and risky behaviors) later on, and to establish evidence-based countermeasures to the deleterious effects of screen time on sleep. How long before bed should kids avoid using screens? 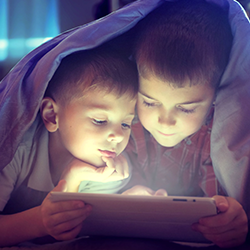 Limiting screen time in the hour or two before going to bed can help with bedtime and sleep. How can parents limit the use of their children's screens at bedtime? Parents should remember that they are key role models, and limit their own evening screen time, charge devices with screens in a ‘sleep-safe zone’, meaning not in a bedroom. Limiting screen time in the hour or two before going to bed can help with bedtime and sleep, but this is hard to “impose” if screen time use is already out of control! Start as young as possible with role-modeling and establishing family practices that everyone can follow. Make this an explicit part of the conversation about the bedtime routine. Also, ensure that the content of media exposure is age-appropriate. How can I modify my screens to reduce disruption of sleep? Dim the screen or turn on system features that reduce blue light—for example, by using an app or modifying device settings. More evidence is needed to know exactly how well the features work, but limiting total light and blue light is a good start if devices MUST be used in the evening. Dozens of studies have shown an adverse association between screen-based media consumption and unhealthy sleep patterns—usually due to later bedtimes and reduced total sleep time. Effects of light emitted from the devices on circadian timing, sleep physiology, alertness. Sufficient restorative sleep benefits health, learning, and safety. Further research is needed to identify effective interventions to reduce the adverse effects of screen time on children's sleep. Plan a bedtime that allows for adequate sleep. Use a bedtime routine that includes calming activities and avoids electronic media use. Limit media use in the hour or two before bedtime. Turn off electronic media devices in the evening and charge them in a central location outside bedrooms. Be a healthy sleep and media role model for your child or adolescent. Remove all electronic media from your child or teen’s bedroom, including TVs, video games, computers, tablets, and cell phones.